Palazzo del Quirinale was initially built towards the end of the XVIth century as a summer residence for the popes, replacing in this function Palazzo Venezia. The new residence, while being, similarly to Palazzo Venezia, at a certain distance from the river to minimize the risk of contracting malaria, because of its position on the hill enjoyed to a greater extent the breeze which at sunset tempers the heat of the Roman summer days. Enlarged and embellished by several popes, with Pope Clement XII (1730-40) the palace became the official residence of the pope. The palace was sacked by the French troops in February 1798: according to the chronicles even the doors were taken away: the French occupied the palace a second time in July 1809 when they arrested Pope Pius VII: however it was soon restored by the French administration as Rome, annexed to the French Empire, became its second capital and the palace became an imperial residence with an apartment for the Roi de Rome (King of Rome), the son of Napoleon born in 1811. The emperor himself was expected to visit Rome in 1812: he never came to Rome, as he headed instead towards the third Rome, Moscow, where his star began its declining course. Pius VII returned to Palazzo del Quirinale in May 1814 and the palace became even more than in the past the papal residence as the conclaves of 1823, 1829, 1831and 1846 were held there and the announcements of the new pope were made from its balcony (Loggia delle Benedizioni), designed by Bernini. When the Italian troops arrived on September 20, 1870, Pope Pius IX, while claiming the illegitimacy of the Italian occupation, preferred to retire to the Vatican. The Quirinale, as the palace is commonly called, then became the residence of the King of Italy and after 1946 of the President of the Republic. ... the solemnity of the portal designed in 1615 by Carlo Maderno for Pope Paul V Borghese is interrupted by a tiny irreverent mask almost hidden in a little case below the inscription celebrating the completion of the portal itself. The domes of its churches, the obelisks and the fountains of its squares, the statues of saints, angels and virtues, the gigantic coats of arms of the popes and the inscriptions celebrating their achievements all contribute to the grandeur and pomp of Rome. But those same popes and artists who wanted and designed these monuments included a sort of antidote against their works being taken too seriously: a laughing mask was very often hidden in works of art designed between 1550 and 1750. The image you see in the background of this page shows a mask hidden in a fountain designed by Giovanni Vasanzio for Pope Paul V.
Bernini decorated Palazzo Barberini with a traditional frieze, but while the triglyphs (maybe you wish to consult my glossary) are designed according to the canons of classical architecture, the reliefs of some metopes are pretty unusual: they portray masks in different moods in a frame of bat wings: it is difficult to understand why in a palace meant to testify to the glory of the Barberini, both the family and Bernini agreed to include these reliefs, but one has to remember that the most celebrated statue by Bernini Apollo and Dafne is a metaphor of illusion, of the possibility of something not being what we believe it is. 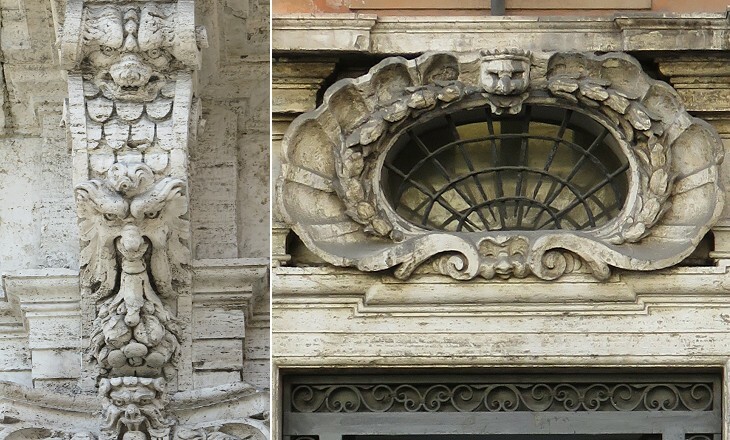 Bernini often hid masks in the lower part of a coat of arms. The eight coats of arms he designed for the baldaquin in St. Peter's all have masks in different attitudes. He personally sculptured the laughing mask of the coat of arms of Innocent X Pamphilj in Fontana dei Quattro Fiumi in Piazza Navona. Bernini hid a slightly mysterious mask, maybe an Egyptian prince, in the pedestal he designed for the obelisk in Piazza della Minerva. Many other coats of arms show hidden masks: they can be seen not only in the coats of arms designed during the Baroque period, but also in those of the XIXth and XXth centuries. 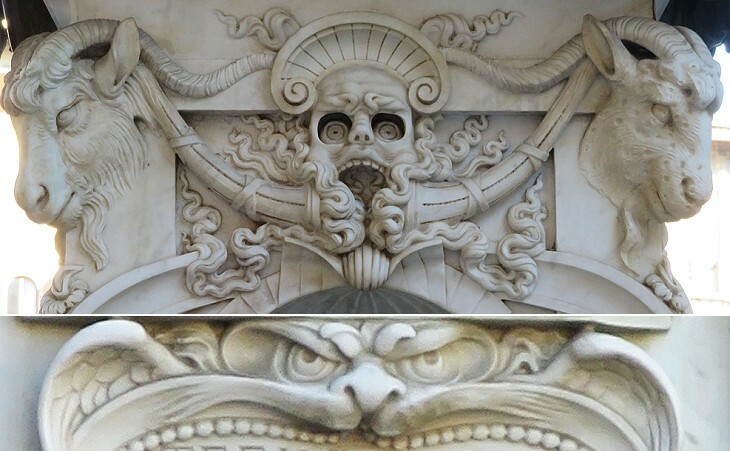 The portal of Palazzo del Quirinale is not the only one to be decorated with a mask. In some cases, rather than being hidden, they constitute the main decoration of the portal. 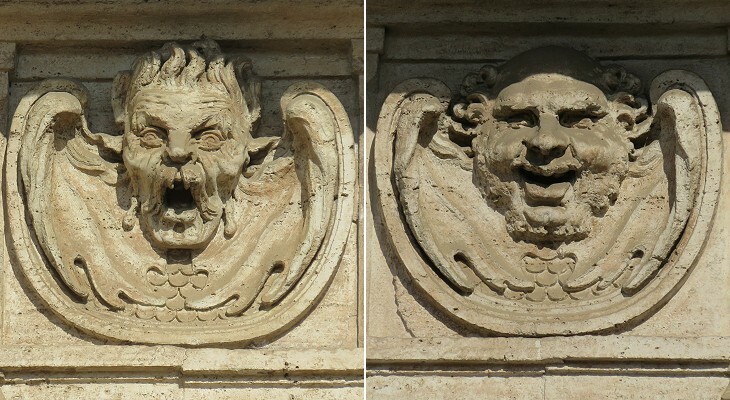 Palazzo Cerri has a very strange mask which portrays a man in the act of waking up and yawning: in addition to the mask at the center of the portal the folds of the lateral decorations design a threatening face. Occasionally one mask was not thought to be enough. 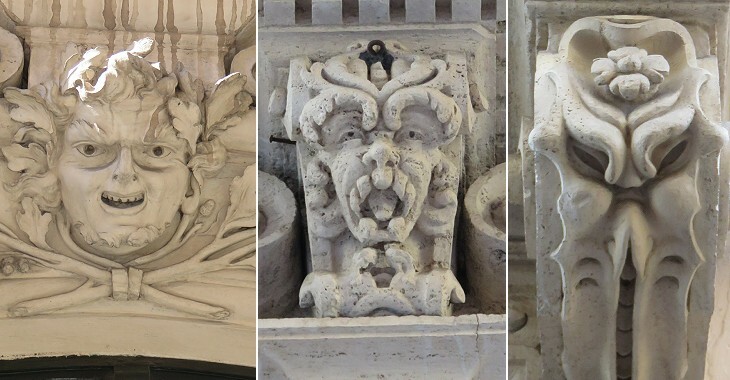 Flaminio Ponzio who designed in 1612-14 the side of Palazzo Borghese overlooking the Tiber included three masks in the corbels supporting the balcony. While the central and the lower masks can be seen from all viewpoints, the upper one can be noticed only from below. Even churches were decorated with masks, although they could hardly be considered a Christian symbol. The masks are usually ignored in the description of the monuments of Rome, nevertheless they contribute to make more human a city which has an excess of sanctity and glory. You may wish to see a page on similarities between the monuments of Rome and those of Florence.